The different geographical zones of the world. The temperate zones span from either north or south of the subtropics (north of the yellow dotted line, at 40 degrees north) to the polar circles. The north temperate zone extends from (approximately 23.5° north) to the Arctic Circle (approximately 66.5° north latitude). The south temperate zone extends from (approximately 23.5° south) to the Antarctic Circle (at approximately 66.5° south). In some climate classifications, the temperate zone is often divided into several smaller climate zones, based on monthly temperatures, the coldest month, and rainfall. These include humid subtropical climate, Mediterranean climate, oceanic, and continental climate. These are the climates that are typically found at southernmost portion of the temperate zone between 23.5° and 35° north or south, and thus are far more influenced by the tropics than any other tepid climate type, usually having warmer temperatures over the year, longer summers and mild, short winters. Freezing precipatation is less common in this portion of the temperate zone. 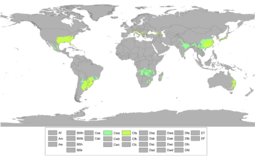 Regions where the Humid (Cfa) and Dry-Winter Subtropical (Cwa) climates are found. Humid Subtropical climates generally have no marked dry season with rainfall and relative humidity evenly distributed over the year, influenced by Humid Tropical regions and by warm ocean currents. They are predominant on the leeward southeastern corners of the continents such as in southeast of South America (Argentina, Uruguay and Brazil), China, The United States, South Africa, eastern Australia and parts of southern Europe namely the Pó Valley of northern Italy. Regions where the Dry Summer Subtropical or Mediterranean Climates are found. Mediterranean Climates, opposite to the monsoonal variety have a dry summer, with rainfall on the winter and cooler months. They occur mostly at the western edges and coasts of the continents and are bounded by arid deserts on their equatorward sides that cause the dry season of summer, and oceanic climates to the poleward sides that are influenced by warm and humid ocean currents and air masses that bring the rainfall of winter. The five main mediterranean regions of the world are the Mediterranean Sea basin in northwestern Afro-Eurasia, the west coast of North America specially California, the southwest of South America namely Argentina and Chile, the Western Cape of South Africa and the south and southwestern coast of Australia. These are variants of the subtropical climates found in high altitude plateaus or montane systems either in the tropics or subtropics, they have characteristically mild temperatures year round, featuring the four seasons in the subtropics and no marked seasons in the tropics, the latter usually remaining mild to cool through most of the year. These occur in the middle latitudes, between 35° and 55° north and south and are the ones with the most of practically equal influence from the equator and the poles, and the most characteristic temperate climates with the typical distinct four season pattern. In these the temperatures remain relatively cool through most of the year as opposed to mild and warm in the subtropics and cold in the subpoles. The Oceanic climates are created by the onshore flow from the cool high latitude oceans to their west. This causes the climate to have cool summers and cool (but not cold) winters, and relative humidity and precipitation evenly distributed along the year. These climates are frequently cloudy, and are fairly milder both in winter and summer in comparison to other temperate climates. Annual rainfall is spread throughout the entire year. Regions with this climate include Northwestern Europe, Northwestern North America, southeastern and southwestern South America, southeastern Australia and most of New Zealand. The Continental climates, as opposed to the oceanic climates have strikingly extreme seasonal differences. With less moderating effect from ocean currents and more influence from tropical and polar large-size continental land air-masses they feature more extreme temperatures in each respective season, with summers getting as hot as those of subtropical or tropical climates and winters as cold as in subpolar climates. They are almost exclusively found only on the northern hemisphere, because this is where there is a large enough landmass to generate extremes in seasonal temperatures. This climate type is found in northeast Asia, the north-central and north- eastern United States and southern Canada, and Eurasia, in eastern, central and northern Europe. These are temperate climates that opposite to the subtropicals are on the poleward edge of the temperate zone, therefore still have four marked seasons including a warmer one, but are far more influenced by the poles than any other but the very polar climates (Tundra and Icecap). Areas with subpolar oceanic climates feature an oceanic climate but are usually located closer to polar regions. As a result of their location, these regions tend to be on the cool end of oceanic climates. Snowfall tends to be more common here than in other oceanic climates. Subpolar oceanic climates are less prone to temperature extremes than subarctic climates or continental climates, featuring milder winters than these climates. This variant of an oceanic climate is found in parts of coastal Iceland, the Faroe Islands, parts of Scotland, northwestern coastal areas of Norway such as Lofoten and reaching to 70°N on some islands, uplands near the coast of southwestern Norway, the Aleutian Islands of Alaska and northern parts of the Alaskan Panhandle, the far south of Chile and Argentina, and a few highland areas of Tasmania, and the Australian and Southern Alps. This type of climate is even found in the very remote parts of the Papuan Highlands in Indonesia. The classification used for this regime is Cfc. In the most marine of those areas affected by this regime, temperatures above 20 °C (68 °F) are extreme weather events, even in the midst of summer. Temperatures above 30 °C (86 °F) have been recorded on rare occasions in some areas of this climate, and in winter temperatures down to −20 °C (−4 °F) have seldom been recorded in some areas. Mostly north of Humid Continental zones this climate features extremely cold and long winters, with short mild summers. In very small areas at high altitudes around the Mediterranean Basin, Iran, Kyrgyzstan, Tajikistan, Turkey, Alaska and other parts of the northwestern United States (Eastern Washington, Eastern Oregon and Southern Idaho) and Russian South-Eastern regions the climate is classified as Dsc with a dry summer climate, such as in Seneca, Oregon or Atlin, British Columbia. This is the closest to the polar climates of all four-season temperate climates as practically all of the year is set up by extremely low temperatures, except for summer. The vast majority of the world's human population resides in temperate zones, especially in the Northern Hemisphere, due to its greater mass of land. The biggest described number in temperate region in the world is found in southern Africa, where some 24,000 taxa (species and infraspecific taxa) have been described, but the native fauna and flora of this region does not have much cultural importance for the majority of the human population of the world that lives in Temperate Zones and that live in the Northern Hemisphere, only environmental importance. Farming is a large-scale practice in the temperate regions (except for Boreal/Subarctic regions) due to the plentiful rainfall and warm summers, because most agricultural activity occurs in the spring and summer, cold winters have a small effect on agricultural production. Extreme winters or summers have a huge impact on the productivity of agriculture. Temperate regions have the majority of the world's population, which leads to large cities. There are a couple factors why the climate of large city landscapes differs from the climate of rural areas. One factor is the strength of the absorption rate of builds and asphalt, which is higher than natural land. The other large factor is the burning of fossil fuels from buildings and vehicles. These factors have led to the average climate of cities to be warmer than surrounding areas. "Temperate Climate" refers to climates between Polar and Tropical. However, there is a gradual change from polar to tropical climates across the middle latitude temperate zones. Normally the northern portions of the temperate zone feature Boreal, Continental, and Oceanic climates, while the southern portions of the temperate zone are often Mediterranean and humid subtropical climates. These different climates all fall within the temperate zone which has a basic definition as being any climate with a mean temperature above −3 °C (26.6 °F) but below 18 °C (64.4 °F) in the coldest month. Obviously winter temperatures will be more mild in southerly portions and colder in the more northerly portions of the northern temperate zone and vice-versa in the southern temperate zone. From a floristic standpoint, each of these climate zones have generally temperate vegetation. There is however, an obvious change in flora from the far northern portions of the temperate zone (Boreal) to the far southern portion (humid subtropical). Pines and conifers are endemic and more abundant in the northern portion of the temperate, while palms may be endemic to far southern portions of the temperate zone. Along with this, the humid subtropical climate may be wrongly separated from the Temperate group of climates, and further associated with the Tropical climates, much because of its name, temperatures and the vegetation found in Subtropical zones which can be somewhat similar to that of Tropical regions (For instance the Atlantic Forest of Brazil is spread across both Temperate and Tropical zones of the country). Additionally, both temperate and tropical species can be found side by side in the far southern portions of the temperate zone (for example in central Florida), while subarctic species might be found growing in northern portions of the continental zone (for example in Northwest Europe). ^ "Weather & Climate Change: Climates around the world". Education Scotland. Archived from the original on 14 April 2016. ^ "Latitude & Climate Zones". The Environmental Literacy Council. Retrieved 15 July 2017. ^ "Patterns of Climate". Weather-climate.org.uk. Retrieved 15 July 2017. ^ McColltoll, R. W. (2005). Encyclopedia of World Geography, Volume 1. Facts on File Library of World Geography. New York: Facts on File. p. 919. ISBN 0-816-05786-9. ^ "Solar Illumination: Seasonal and Diurnal Patterns". Encyclopedia.com. Retrieved 4 October 2012. ^ Cohen, Joel E.; Small, Christopher (24 November 1998). "Hypsographic demography: The distribution of human population by altitude". Proceedings of the National Academy of Sciences of the United States of America. 95 (24): 14009–14014. doi:10.1073/pnas.95.24.14009. PMC 24316. PMID 9826643. ^ Germishuizen, Gerrit; Meyer, N. L., eds. (January 2003). Plants of Southern Africa: An Annotated Checklist (PDF). Strelitzia. 14. Pretoria: National Botanical Institute. ISBN 978-1-919795-99-7. ^ a b Burroughs, William James (1999). The Climate Revealed. New York: Cambridge University Press. p. 114. ISBN 978-0-521-77081-1.